I am back home after two months on the road. Back at my loom…yay. It’s always nice to come home to projects that are set up and ready to go. That’s always a nice way to ease back into things. I had taken two projects with me to weave in free time. I didn’t get a lot done! I think I showed this one with the word ”backstrap” completed before I left and all I got to add while away was the word ”weaving” and a little flower…. It is a band in 60/2 silk that I am weaving to sample letters. 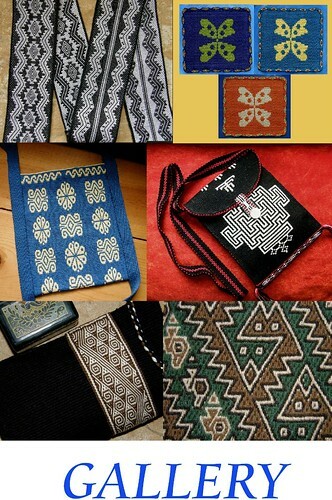 I want to weave a strap for a pouch showing the word for ”weave” in different languages. The last time I attempted such a project, I created the letters in weft twining and I was only able to fit six words onto the strap for my loom bag (at left). I hope I will do better this time. If you look at the black background in my picture you will see the texture that Bolivian weavers created by using both s and z-twist warp yarn. Yes, 60/2 silk is some crazy stuff to be handling no matter what size your hands and fingers are. When I am using fine thread like this. I change the way I do my pick-up and set up the warp so that I can use a pick-up stick rather than having to hold threads in my hands. That is the beauty of having worked with backstrap weavers from so many different places. I have a variety of techniques from which to choose according to the kind of yarn I am using or the kind of structure I want to create. I just love getting my fingers in among the threads, but sometimes a smooth pick-up stick works better for me. It is not only about the size of the thread. You might know how silk thread wants to catch on every little imperfection in the skin of your hands and fingers! The other project I took on the road was a three-color reversible pebble weave. I am using tapestry wool for that which I bought at the Australian Tapestry Workshop. I had bought the wool for practicing the braid that had I learned with Rodrick Owen at the BRAIDS 2016 conference last July and I thought this wool would be a nice souvenir of my visit to Melbourne. Then I thought….what the heck, let’s try it for band weaving. It doesn’t stand up to warp-faced weaving too well and I am afraid that the off-white thread won’t be lasting much longer. The green, on the other hand, has a totally different character and is performing beautifully. Three-color pebble weave isn’t something I do all that often and so I am weaving this piece to remind myself of the steps as I plan to make something much larger in silk. Of course, a silk sample will have to follow. I can’t wait! I can easily handle these threads with my fingers and I love feeling the wool in my hands. When I make my silk sample, I will come up with another way to handle the threads. My weaving friends Deanna and Margaret took me to the San Diego Zoo. Yes, you can get this close to the gorillas! It so happens that one of the gorillas’ favorite places to hang out is right up against the public viewing window. I am sure that the window must block sound as the gorillas would otherwise be driven crazy with the constant outpouring of ”ooh and ahs”, and laughter and squeals from the public. There the gorillas were reclining and napping. The bored baby gorilla pounded mom’s belly like a drum as she tried to sleep. I found this gorilla’s hand fascinating. From there, let’s look at some little hands in among the warp threads. I got to visit with my weaving friend Lori and her family again on this trip. Lily, now seven years old, is doing Andean Pebble Weave in the way I was taught by my teachers in Ayacucho, Peru, that is, with two sets of string heddles. 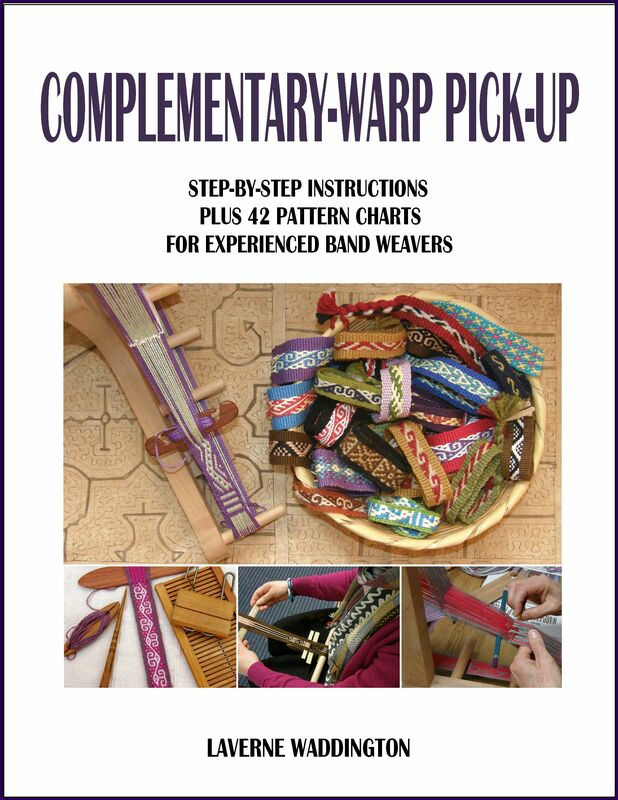 She picks up her pattern threads at the cross sticks and knows just how to operate those two sets of string heddles. It has been fantastic watching her progress over the years. 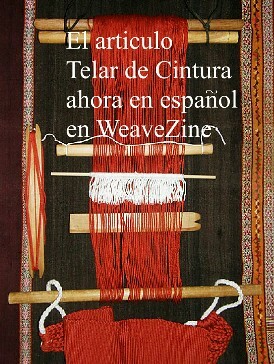 I now have video clips of her weaving at 5, 6 and 7 years old. Such fun! Take a look at her doing some pick-up and working those heddles! Lily is left-handed and was taught by her left-handed mom. Of course, she doesn’t stay put at the loom for too long. A group of us were weaving in a barn on a farm and there was a whole field of beautiful wild flowers outside just asking to be picked. After a few weft picks Lily was skipping off to pick some flowers. That was such a great weekend out there on the farm! Lori got a group of friends together and we wove. Most people wanted to try their hands at creating wider warps that could be used to weave cloth for a small pouch. They all chose to use the Andean Pebble Weave structure for the patterns. I loved the asymmetric warp that Jennifer created. I am such a slave to symmetry so it’s always nice when someone shows me how naturally asymmetry comes to them. These beautiful fields in their misty valley greeted us each morning. We had the whole barn that the farm’s co-op uses for selling its produce to ourselves. There were so many interesting possibilities for attaching warps. Once the fog lifted, it was glorious outside. Kate brought a warp she had obtained in Guatemala with leno in progress. She wanted to get the hang of opening the sheds on such a wide piece and was comfortable outdoors enjoying the sunshine and mild temperatures..
Here’s one of those busy tables that I so love. Much of the first morning was spent with rulers and calculators measuring samples, planning colors, picking patterns and figuring the number of warp ends as well as practicing warping…yes, practicing warping…I insisted. And, I think everyone agreed that it was a worthwhile exercise. Lori’s beautiful purple and gold warp just happened to match the dried flower arrangements that were scattered throughout the barn. This piece will become a small pouch. Here’s her warp set up and ready for weaving. She is setting the width. We calculated how many warp ends were needed using samples and got to within 2/16” of the planned width on all the projects. I was really pleased with that. Karen had brought sticks from her garden and would just pick one up and cut it to size when she needed a heddle rod or cross stick….love that! That’s Angela at work on her pouch fabric….hands in warp threads…love it! Rose, Cynthia and Sharon are hard at work weaving. The warps were wider than any they had ever made before but not terribly long. They had small pouches in mind and they had enough length of warp to allow them to weave the planned length of fabric without being crammed right up at the end beam trying to weave the last inch or so. I can’t wait to see how these projects turn out. Lori organizes regular gatherings with these ladies so that they can work through problems together or simply enjoy weaving side by side. Onward to another group of weaving friends and another delightfully chaotic table! 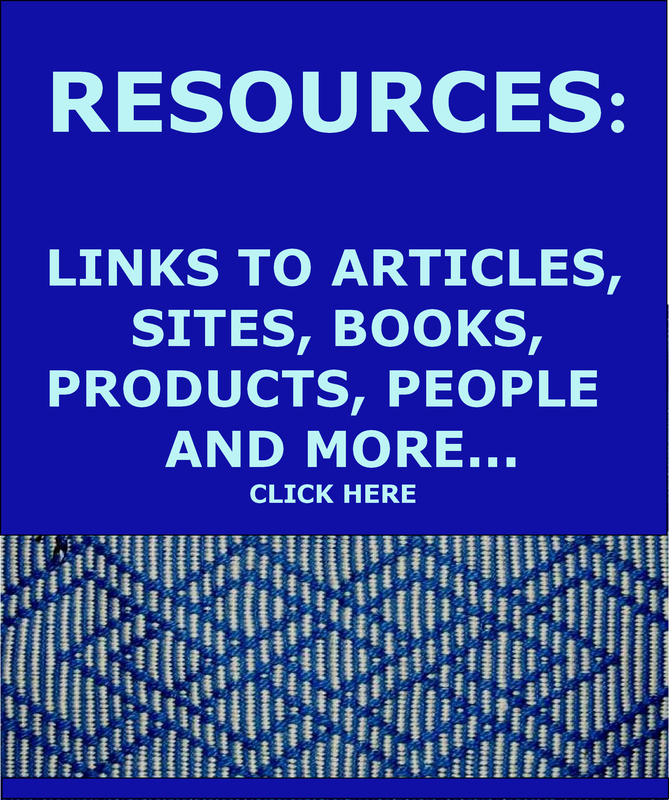 This is another group that organizes regular backstrap weaving gatherings… this time in Phoenix. This was a sewing day as we practiced sewn tubular edging bands and other embellishments for finished cloth…. Caroline is weaving and sewing a plain-weave tubular band to the edge of some gorgeous handwoven cloth made by my weaving teacher and friends in Bolivia. Collyer decorated one edge of her cloth with coil stitches and also wants to add a ñawi awapa tubular edging to a felted purse that she recently made. You can see the wool warp that she prepared. It matches the felt so well. I created some excitement when I brought out my double weave samples. I think we will get together and play with double weave next year! My friends in San Diego wanted to do just that this year….double weave. Rocio was so pleased when the steps started making sense and her first patterns emerged…. Look at the nice cushy armchairs some of the group got to sit in and weave! We just about filled Deanna’s living room and sometimes I have no choice but to crawl under the warps to get from one person to the next! Deanna quickly slipped into the rhythm of warp-faced double weave. There are some unusual moves to be made but, once you start understanding the ”why” of it all, the steps become easy to remember. Meg discovered how easy it is to chart patterns from cloth and took advantage of my sample selection to add to her collection of charted motifs. As always, it was a fun spending time with Deanna. This time we had a little extra time up our sleeves and we went to the Zoo and also to the Mingei Museum in Balboa Park. Balboa Park is an amazing place! The historical buildings from a couple of world expositions in the early 1900s are spectacular. The park is packed with museums, theaters and gardens. This building is the Speckels Organ Pavilion. The organ, one of the world’s largest in an outdoor setting, was donated in 1914 and has 5000 pipes ranging in length from a pencil to thirty-two feet! On Sundays, the door rolls up for free concerts. We were lucky in that it seemed that an audition was being conducted and we could enjoy hearing (and feeling!) some moments of music. At the Mingei I was quite taken with this quirky collection of Japanese dolls made with eggs. This one is clutching a copy of Time magazine. Others held burgers and even a surfboard!…traditional clothes meet modern times, I suppose. A visit to my friend Diane in Grass Valley was possible on this visit too. Of course, we wove. Diane invited others and six of us sat together and worked on all kinds of things. That is when I got to weave a bit of my lettering band. Diane wound a warp for a backstrap with an Andean Pebble Weave pattern from my second book...I hear it has been progressing well since I left. 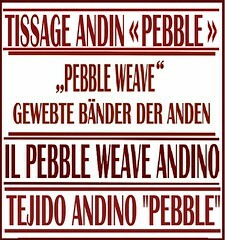 By the way, a new Andean Pebble Weave pattern book is underway! One of the baskets that Jane recently made. One thing that Jane mentioned during her program which, while being obvious, is not something I had previously contemplated….every basket you ever see was made by hand. No machine has yet been created that can replicate these woven structures. I like thinking about the hands, big and little, around the world today and throughout history working all kinds of natural materials into these magnificent and useful pieces of art. And, guild member Bhakti, whom I had met way back in 2010 at Convergence in New Mexico, turned up with a fabulous Karen backstrap loom to give me! It has a circular warp on it that the Karen weavers had created to teach her how to use a backstrap loom. It uses hefty split beams to sandwich and anchor the cloth. I always end up with terrible problems trying to get everything back to Bolivia in my luggage. But, I didn’t care if I went home without clothes….this loom was going home with me! It had a large piece of pvc pipe as the shed rod. I left that behind and I will replace it with something of my own here at home. I can’t wait to sit down and study the patterning and heddle set up. I love the rice sack backstrap! The warp is extremely long. Bhakti shared with me a picture of two of the Karen ladies at their looms. It is interesting to see how high up on their bodies they place their backstraps. So, the loom got packed into one of my bags in among the skeins of 60/2 and 120/2 silk that I got from Red Fish Dyeworks. The ladies at Red Fish did an amazing job filling an order over which I had been dithering for weeks. Ginny and Mary helped a lot by letting me examine their samples. They even gave me some of their silk. It is so hard to order colors from those you see on a computer screen. I am really excited about the luscious colors. This will be used for one of my big Bolivian summer projects. I finished my visit in the northwest. I visited friends Elinor and Einar in Skagit Valley. Elinor helped me with some sewing and I helped her with some weaving. A good deal! She is making this striking Andean Pebble Weave belt for her husband for Christmas. This is one of the patterns I adapted from komi knitting for my second book. 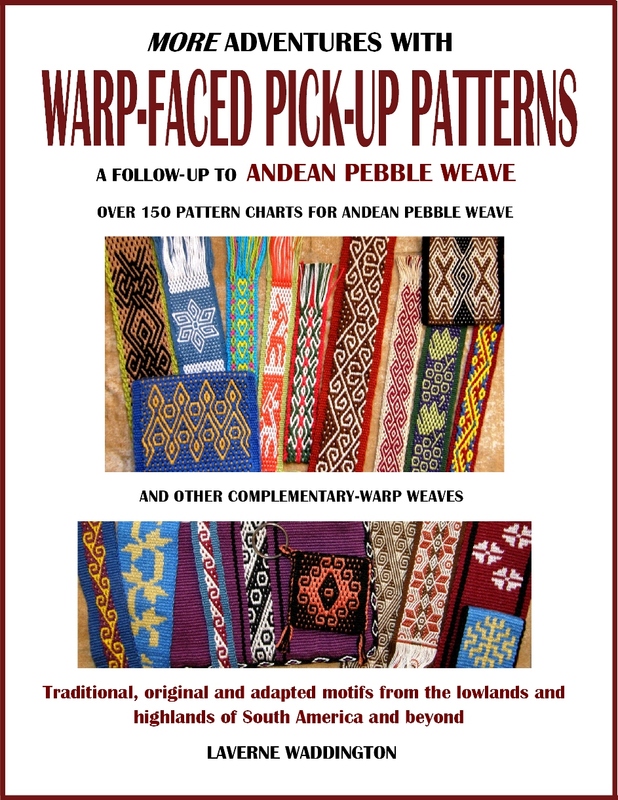 Oh, did I happen to mention that I am working on a new Andean Pebble Weave pattern book? But I spent most of the time in Seattle with Marilyn. There’s a lot to tell about that and that will come in another post soon! It was a very special visit. I will give you a hint… I spent a lot of time in front of a camera while there rather than behind one. During the visit, Marilyn also took me to a gathering of her tablet weaving group in Seattle. It was nice to see many familiar faces…people with whom I have woven while visiting the area in the past and people I met at the recent BRAIDS 2016 conference. There was Show and Tell of beautiful tablet-woven bands and discussion of future themes for study. It was an impressive study group that got down to business and achieved a lot in their time together. Thanks Laverne! Can’t wait for the next post and the exciting news! What a pleasure to read of your West Coast adventures! I can’t wait to hold your next book of Andean Pebble Weave patterns in my hands…and to see what all your recent film work is about. October 2017 seems like a long time to wait for you to return to the Northeast and my fingers are crossed you will return to Vermont again. But for now you have the whole Bolivian “summer” ahead of you to weave finer and wider and longer. with that delicious new silk……Enjoy! Thanks, Lausanne. I am looking forward to being with you in gorgeous Vermont again. Laverne thanks for sharing! I love reading about your hobby and travels! Thank you so much! Although, I have to say that it quite a bit more than a hobby these days! It has become an almost all-consuming way of life! very nice. i’d be interested in buying some finished items by you. Well, thank you! but, sorry, I don’t weave to sell right now. I weave for the pure fun of it. Wow, so much to share! I can’t imagine doing pebble weave at 7! I’m fascinated with the Karen loom, as I’ve been wanting to make some split beams for a wider loom. What is the diameter of the front beam? Hi Kristin. Lily wants to do all the weaving her mom does and use her colors too! The front beam of the Karen loom is 1 1/4” in diameter. Take pictures please when you make one. I am sure that others would love to know how you go about it. Reading your posts is like opening a gift. Such treasures! Thank you! Sending you big hugs, Deanna. I so enjoyed my stay.